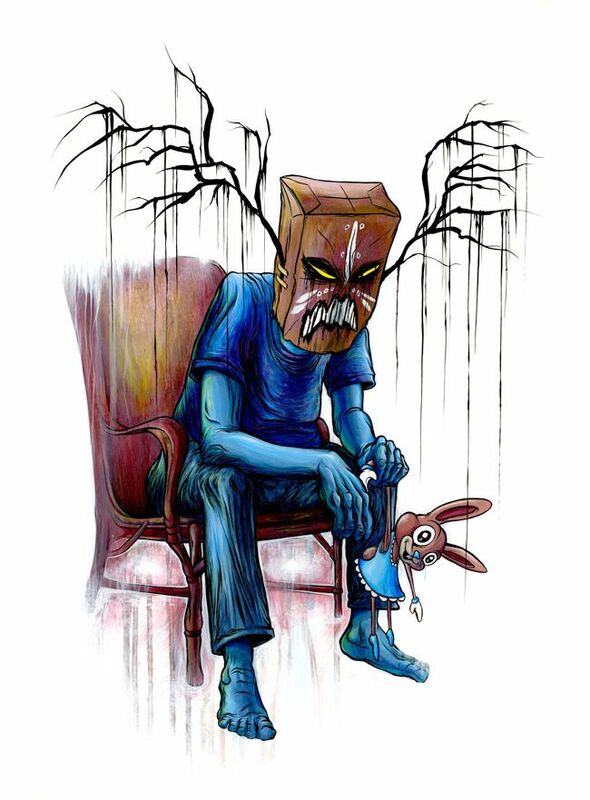 ALEX PARDEE'S LAND OF CONFUSION: ALL YOU NEED TO KNOW ABOUT MY VERTIGO SHOW!!! After 3 months of prep and 500 gallons of blood, sweat and mostly tears, it's finally(Verti)GO TIME! My brand new solo art exhibition, "VERTIGO: A Decade of Hunting Nightmares" opens at Corey Helford Gallery in Culver City, CA, tomorrow night, Saturday Jan 8th at 7PM-10PM! 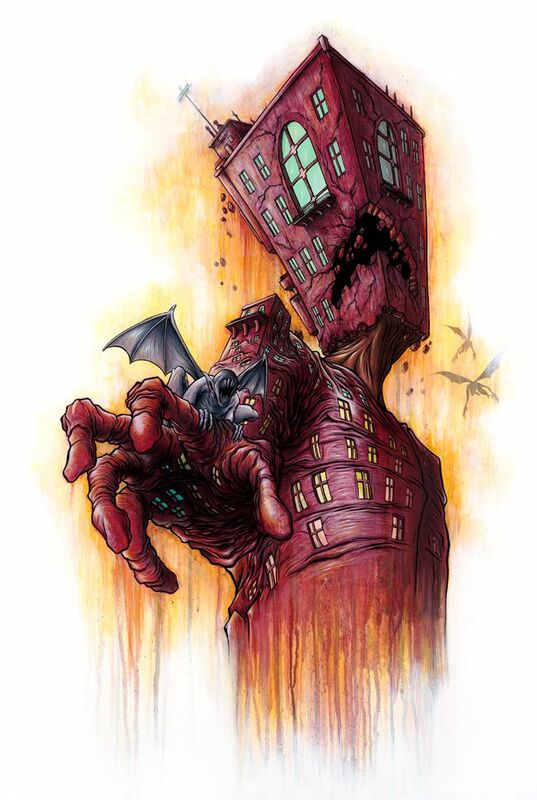 CLICK HERE to go to Corey Helford's website for all of the gallery info. Though the details below contain everything you need to know about the show (minus some magical moments that will be revealed at the show on Saturday), they are far from short, but are definitely sweet. Let's start this madness in my favorite activated Wonder Twin power form: SIMPLE QUESTION AND LIST FORM! 1. Q: How much new art will there be? A: 13 brand new acrylic on wood paintings, plus some crazy installation piece to go along with the "story" of the art show. 2. Q: What do you mean, "story"? A: I created an in-depth story about a famous game hunter-turned-exorcist that would act as inspiration for all of the visual elements of the art show. If you wanted to know more about the story and about Verti Parker, the game hunter who is the inspiration for the show, you can CLICK HERE to go read Verti's entire origin story that leads into the art show on a website specifically created to share Verti's story, or you can jump down to the bottom of this post and read the way-shorter all new summary of the epic tale!!! 3. Q: Will I get anything for FREE just for showing up? A: Funny you should ask, because YES! 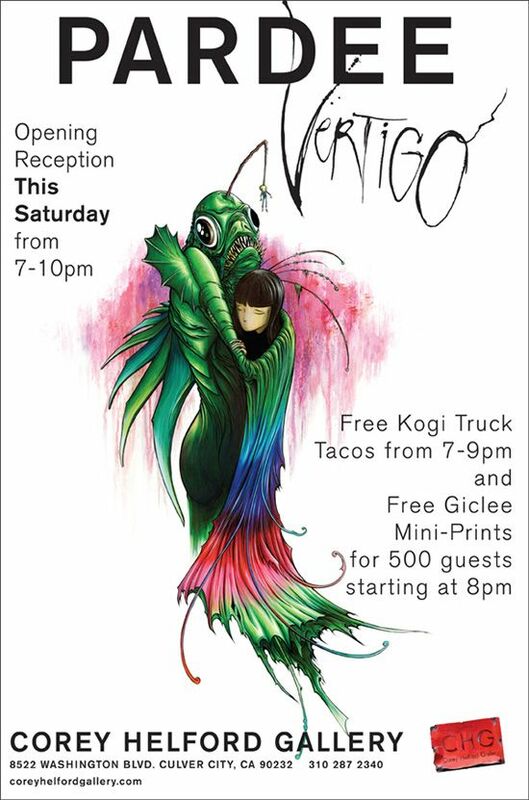 The first 500 people to come to the opening will receive a FREE print of the above image on the flyer! For reals. For free! It is Corey Helford Gallery & my way of saying thank you for helping support my biggest and best show yet. And oh yah, FREE TACOS MADE OUT OF GENUINE MONSTER MEAT COLLECTED FROM VERTI'S HUNTS! And as an EXTRA bonus, my good friend, director of Hatchet & Frozen, Adam Green, is going to bring a few autographed Hatchet 2 theatrical posters and giving them out to the first 5 people to show up to the show in a Hatchet Army shirt! 4. Q: Why is this show such a big deal to you? A: Well, all of my shows are big deals to me, but this represents a number of landmarks. Showing at a fine art gallery as prestigious as Corey Helford is something I have never had a chance to do before. Also, for the first time ever, I have painted using acrylics, which is a huge new direction for me. Most of my previous work has been watercolors & inks. And I built all of the wood panels that I painted on by hand, which makes them full of love. There will also be actual artifacts on display from Verti himself, as well as a surprise little monster that may have been unfrozen and shipped over to the show at the last minute. Lastly, Verti's "story" and the whole universe surrounding him and the nightmares is my favorite story I have created to date and I want to share it with everyone in the world. Finally, check out some of the preview images below, but FIRST check out this amazing video teaser shot by the one and only director STEPHEN REEDY & Cinematographer CHRIS SAUL showing a little glimpse into Verti's nightmare hunting world! Hope to see you all at the opening, wish me luck! While in a small fishing village in Finland in 1985, world famous game hunter Caleb “Verti” Parker stumbled upon a strange occurrence that led him to believe that a special composition of music, when played at the correct pitch and speed, could lure nightmares out of the minds of the people who suffered from them and materialize these nightmares into the physical world. As Verti had grown bored from years of hunting every game animal known to man, the sheer possibility of monsters manifesting into reality from peoples’ nightmares excited him. He realized he could hunt these creatures and have entirely new adventures while also helping to rid these nightmares from from the minds of the victims who had been suffering from them. Verti began feverishly researching and testing his theory. Verti continued to travel the world with his music box and a small team of associates, exorcising nightmares from those stricken so badly by the visions that their lives had been destroyed. Over the course of ten years, Verti had encountered a wide variety of monstrous creatures, each one offering a new challenge more invigorating than the last. Because of the nature and secrecy of his work, little official documentation had existed about Verti’s adventures and the nightmares he exterminated until Verti crossed paths with Horace Chalem, a self-proclaimed “historian of the extraordinary.” Horace and Verti became close friends, and Horace, realizing immediately how “extraordinary” Verti’s experiences had been, wrote a 500 page biography documenting Verti’s entire life leading up to his unannounced retirement in 2009, when Verti simply packed up his life and relocated without so much as a simple note saying where he had gone. Horace passed away that same year, before he got a chance to publish Verti’s biography. When Horace’s house was cleaned out, Verti’s biography, along with hundreds of other extraordinary historical tales, was sent to Mexico City to be catalogued in “el Archivo de Obras Inéditas” (the Archive of Unpublished Works), where they were to be filed away and likely lost forever. 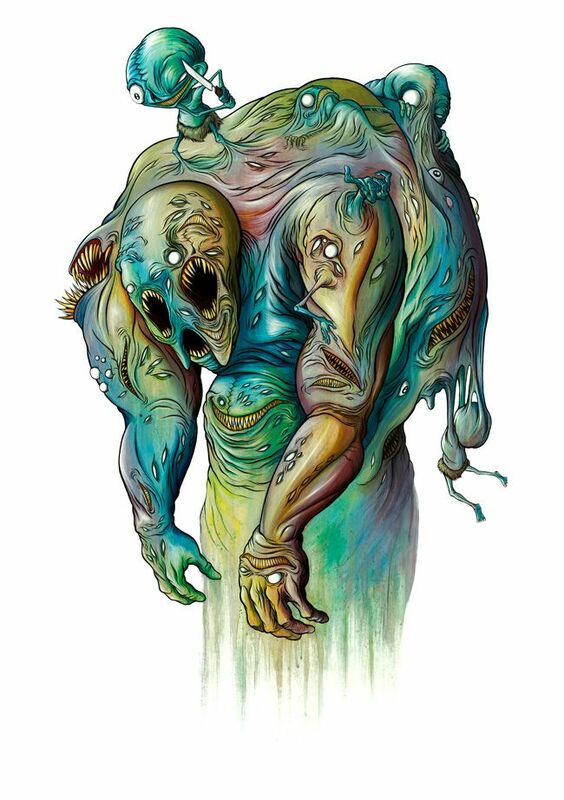 But in June 2010, artist Alex Pardee was visiting Mexico and stumbled upon the Archive, where he ended up spending the entire duration of his trip discovering its numerous strange articles and absorbing as much inspiration as he could from diaries, songs, and other misfit documents that had been long since forgotten. It was there that Alex read Horace Chalem’s entire biography of Caleb “Verti” Parker. And it was there that Alex fell in love with Verti Parker’s mysterious world of nightmares and made the decision to dedicate the next six months of his life to translating some of Verti’s most horrific “nightmare extractions” onto canvas to share with the world in hopes that Verti’s discovery and his adventures would find a new life amongst a new audience of people eager to be inspired by the extraordinary.